Martin Leman was born in 1934 in London. 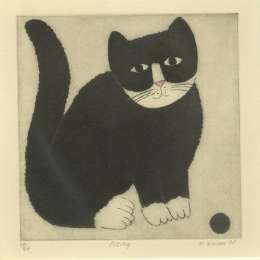 He was always interested in art and after his schooling he attended Art school in Worthing. This was followed by his compulsory National Service in Egypt. Upon completing National service, Martin studied at The Central School of Art and Design Holborn, after which he worked as a graphic designer and taught at Hornsey College of Art , London College of Printing, St. Martin’̛s School of Art and Medway College of Art. Not only is Martin Leman an artist but he has also published many books. His first book of paintings was published in 1979. Since then he has had a further 28 books published as well as 25 one-man painting shows and numerous mixed exhibitions including the Royal Academy Summer Exhibition. 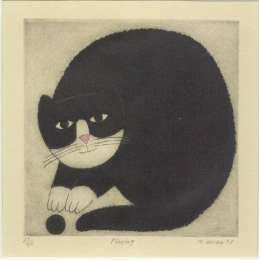 He was elected a member of The Royal Society of British Artists in 2007. 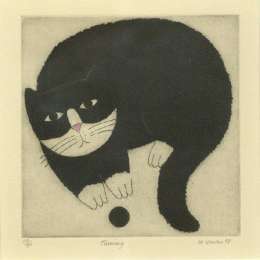 Martin Leman began painting in 1969 and had his first one man show in London in 1971.His work quickly gained prominence and he acquired an international reputation through the publication of many books of his cat paintings which appeared regularly throughout the 1980s and 90s. Another of Martin̛̛s favourite subjects for paintings are his portraits of women which he brings his unique style to them. 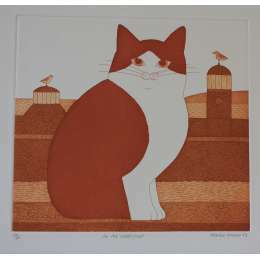 As with cats the paintings, Martin has a style of his own which is easily recognisable. Apart from images of cats and women, Martin also likes to paint still life and is exploring the subject of landscapes all in his own imitable style. 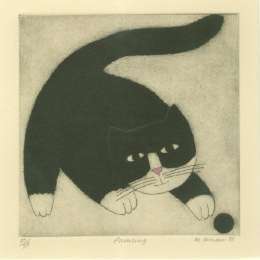 Martin Leman limited edition etching "Playing"
Martin Leman limited edition etching "Posing"
Martin Leman limited edition etching "Pouncing"
Martin Leman limited edition etching "Turning"
Limited edition etching by Martin Leman titled "On the Waterfront"